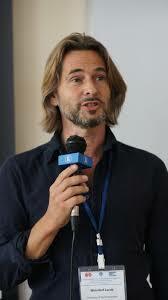 Jacob Weisdorf, University of Southern Denmark. Historical estimates of workers’ earnings suffer from the fundamental problem that annual incomes are inferred from day wages without knowing the length of the working year. This uncertainty raises doubts about core growth theories that rely on existing income estimates to explain the origins of the wealth of nations. We circumvent the problem by building an income series of workers employed on annual rather than casual contracts. Our data suggests that existing annual income estimates based on day wages are badly off target, because they overestimate the medieval working year but underestimate the working year during the industrial revolution. 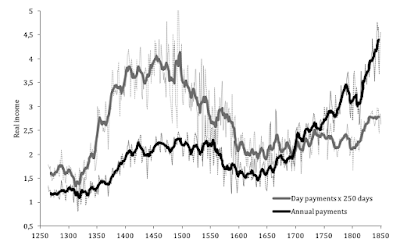 Our revised annual income estimates (see Figure) indicate that modern economic growth began almost two centuries earlier than commonly thought and was driven by an ‘Industrious Revolution’.